Comments: North American porcupines are heavy bodied, yellowish-black rodents that move with a slow waddling gait. On the Great Plains, they are the second largest rodent, behind only the beaver. They have reddish-orange incisor teeth, poor eyesight, and curved claws. As many as 30,000 yellowish-white quills are hidden within the fur of their back, rump, and tail, but are absent from their belly. 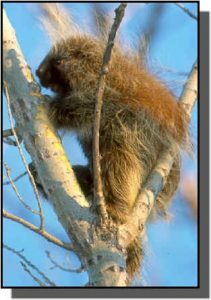 Porcupines make their dens in hollow trees, small caves or under rock ledges and are good climbers. They are solitary and generally forage at night. When challenged, they arch their back and slap the aggressor with their heavily-quilled tail. Usually, a single cub is born in April or May. They may live 20 years in the wild. Distribution: North American porcupines range from northern Mexico to Alaska. They inhabit wooded areas in central and southwestern Kansas. Food: They feed on the tender bark in the tops of cottonwood trees and on grasses, forbs, alfalfa, and corn.